The European Union saw in 2017 the lowest number of detected illegal border-crossings since the migrant crisis began four years ago, the EU border agency Frontex said Tuesday. "The annual total of 204,700 marked a significant decrease compared to recent years, but not yet a return to the situation before 2014," the Warsaw-based agency said, upon releasing a new report based on figures provided by EU member states. It amounted to a 60 percent decline from the 511,000 illegal border-crossings in 2016, and far below the 1.8 million in 2015, according to the report. The drop was especially observed on the eastern Mediterranean migratory route which connects Turkey to Greece, and the central Mediterranean route connecting Libya to Italy. The EU last year reached controversial agreements with chaos-wracked Libya to stem the flow of migrants from that country, following a more comprehensive deal with Turkey in 2016, which sharply reduced the number of people crossing to Greece. However, the western Mediterranean route, which involves making the sea crossing between North Africa and Spain, saw an increase in the number of illegal migrants. 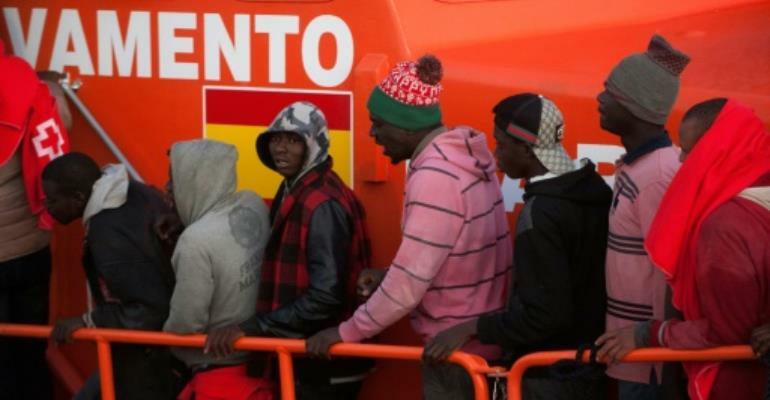 "Domestic issues in Morocco, the main transit country for migrants heading to Spain, created an opening for more departures from Morocco's western coast in particular, which starting from the second quarter of the year led to the use of high-capacity boats able to transport large numbers of migrants," Frontex said. Given the change in migratory routes, the relative share of Africans -- including Moroccans, Algerians and Tunisians -- increased compared to 2016. "African nationals accounted for almost two-thirds of irregular migrants arriving at the shores of the EU," Frontex said. While Frontex noted the significant decline in migrant arrivals to Greece, which had been a major entry point into the EU, a Greek NGO on Tuesday claimed authorities were illegally expelling refugees to Turkey. On the Turkish-Greek border, the Greek Council of Refugees (GCR) said in a statement at least 40 people were arrested and sent back to Turkey in 2017, including "families in vulnerable situations, pregnant women, minors and victims of torture." GCR called these actions "arbitrary" and against international law. Contacted by AFP, Greek police denied the allegations.